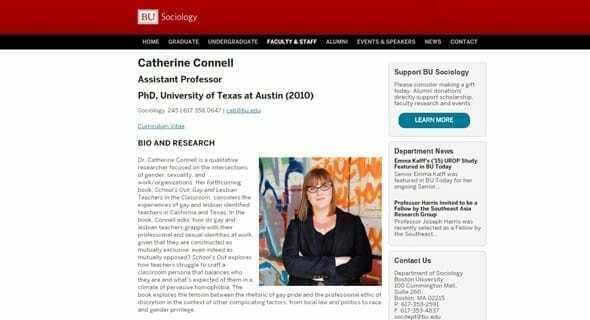 The 411: What started as an extracurricular class in high school has turned into a successful career for Dr. Cati Connell, an assistant professor of sociology at Boston University. Since childhood, Dr. Cati Connell has been fascinated by how people make the choices they make, what kind of adversities they face and how those adversities change the course of their lives, particularly when it comes to disadvantage and privilege. “I just fell in love, and it’s been a love affair ever since,” she said. Overall Connell’s work centers around gender and sexuality, but what she’s really interested in is how the institutions that we spend so much time in, like our jobs and school, shape who we become even in ways we wouldn’t expect. She takes this interest a step further in her latest book “School’s Out: Gay and Lesbian Teachers in the Classroom,” which analyzes how gay and lesbian public school teachers contend with the dueling expectations of being professionals in the classroom and proudly representing who they are. For the book, Connell interviewed elementary, middle school and high school teachers who worked in urban and rural areas in California and Texas and who ranged in ages from 22 to 77. She interviewed roughly the same number of gay and lesbian teachers and also spoke with administrators, colleagues and educational advocates. Her main goal was to better understand the pressures these teachers face to project a “normative and heterosexual representation” of themselves and how they navigate those demands. “On the one hand, gay and lesbian teachers have to contend with this expectation that they keep their sexuality out of the classroom and that they present themselves as very gender normative, and on the other hand, there’s this increasing demand within the gay pride community that all LGBTs should be out and proud at all times,” she said. Dr. Cati Connell’s book examines the pressures gay and lesbian teachers face. 1. Clash between pride and professionalism creates a series of no-win choices for gay and lesbian teachers. “Their choices were more vulnerable, the stakes were higher and their options were more limited,” she said. 3. Legal context matters. For example, teachers in California said they were more comfortable and secure in coming out than teachers in Texas. But ultimately Connell found legal context doesn’t play a role as much as she would’ve thought and or in the way she would’ve thought. Not only does Connell hope her book encourages people to think more critically about the structures of the teaching profession in the United States, but she also wants people to consider the demands that “out and proud” expectations place on more marginalized gays and lesbians. Dr. Catherine Connell is a qualitative researcher focused on the intersections of gender, sexuality and work/organizations. Connell’s next research project will consider the legal and cultural ramifications of the repeal of Don’t Ask, Don’t Tell on the U.S. military. She is currently at work on a content analysis of the media’s framing of the repeal and will soon begin ethnographic and interview research with current and former LGB soldiers. She is also interested in understanding how the continued official exclusion of transgender identified soldiers affects trans veterans and their access to benefits. 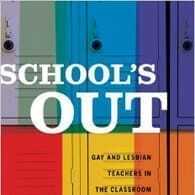 “School’s Out: Gay and Lesbian Teachers in the Classroom” is available on Amazon, and you can learn more about Dr. Cati Connell at www.bu.edu.